This is apparently a bit of a Sydney institution. 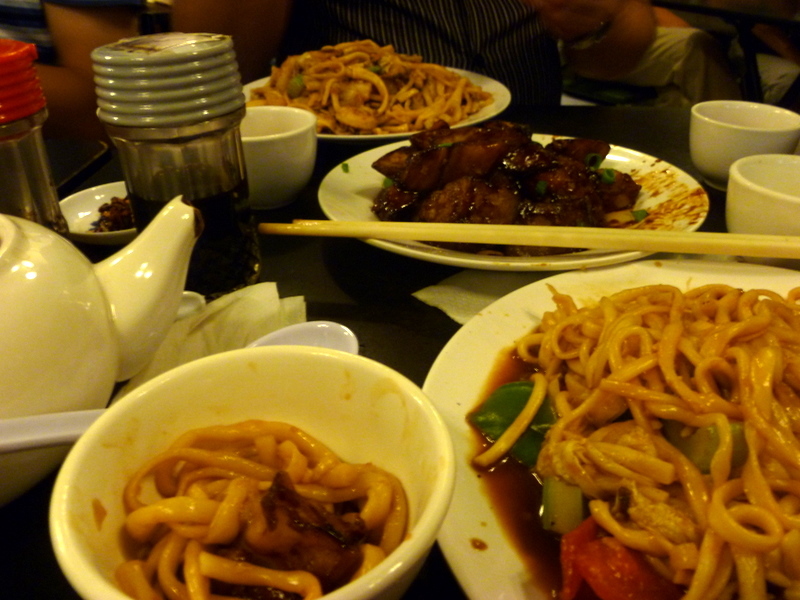 Nestled among other similar asian eateries under a load of escalators up to a shopping centre is the Chinese Noodle Restaurant. Famous for its brusque service, especially during busy periods, the staff will not think twice about asking you to move, mid-meal to shuffle things around a bit to enable them to accommodate a group that has just arrived. They have a lady at the door who waves you to a seat. You may have to queue a little while, but no-one steps out of line, thanks to her abrupt style. I am told that there was an older lady who would shout at you, and took no nonsense from the students and after hours crowd that this restaurant is popular with, but she seems to have retired, so we didn’t get to meet her. However, we were treated to the gentleman at the door giving us a little violin concerto, which started with happy birthday (as far as I could make out, it was no-one’s birthday in the restaurant), and jingle bells, before moving onto what sounded more traditional eastern music. The tiny interior is decorated with interesting tapestries, and the ceiling is adorned in the traditional style… with a plastic grape vine! You can watch them make their noodles by hand through a small window into the kitchen. You get a pot of tea as you are seated, but you can also bring your own if you want alcohol. The place buzzes with the chatter of the patrons and the shouts of the usher at the door. I found it fascinating, then, that orders are placed by the waiting team in a much quieter voice, delivered just outside the kitchen door, but with a cupped hand around their mouth. Given how frantic the kitchen looks through that tiny window, there must be an interesting acoustic quirk of the restaurant for everyone to be able to the right orders, which they do. The style is Northern Chinese, and you can choose from the hand-made noodles (with or without soup) steamed, boiled or fried dumplings, and some interesting looking pancakes. 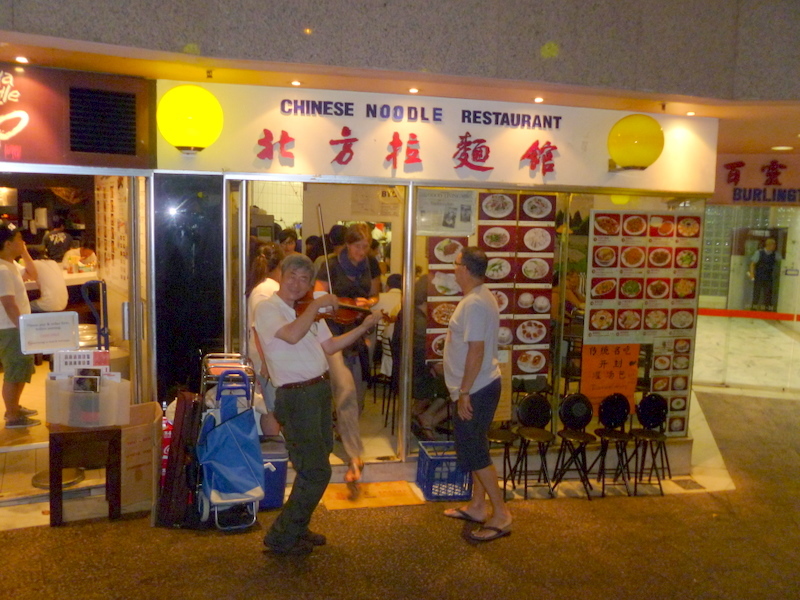 There were three of us that went, and we chose egg and chive fried dumplings, vegetarian noodles, seafood noodles, and an amazing dish that they describe as braised aubergine. As far as I could tell, it had been braised in soy and garlic, but it was so good. I am sure it is one of those dishes that I will never be able to reproduce at home.You get to make your own strength dipping sauce from fiery dried chilli, black vinegar and soy sauce, I guess that way there is no complaints if it is too hot. The bill for this was just $4o, and the food was far too much for us to eat in one sitting. Luckily, the team are happy to have the table clear quickly, so there are never any objections if you want to take the rest of your meal home to finish off later, and it returns to you boxed and ready in mere seconds. Great value, a great atmosphere – people really do enjoy the abruptness, and they are right to – and great food. Locals tell me that you should beware of close-by imitators, and go for the real thing at the Chinese Noodle Restaurant every time.